He's a software engineer who earned a doctorate in computer science after majoring in music and philosophy. She's a software engineer and former social worker who studied psychology. 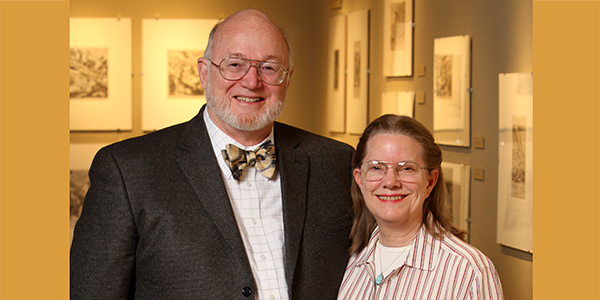 Neither took a single art class at Westmont, but Dewayne '62 and Faith Mell '62 Perry have become educated and passionate collectors of prints, especially 16th and 17th century Northern European prints. Reynolds Gallery featured a handful of these works in February 2009, and the Perrys promised the collection to Westmont as a teaching tool. They also added to the festivities at their Golden Warrior Reunion 50th in 2012 by bringing a special art exhibit with them, "Five Centuries of Biblical Prints." Early in their 51-year marriage, the couple chose to pursue common interests, especially music and collecting. Dewayne started buying books and music as a college student; today the Perrys' library features 10,000 volumes and thousands of CDs and musical scores. Their other interests range from 18th century English porcelain to American antique furniture, rugs, ceramics and work by Texas artists. The couple moved to Austin in 2000 when Dewayne joined the faculty at The University of Texas at Austin. Grateful for their college years, the Perrys are excited to leave something tangible to the college. "I love the sense of community at Westmont," Faith says. "It's hard to put our experience into words; we know our education set us up for life and taught us how to continue to learn." "Those who've been given much should give back," Dewayne says. "We've been careful stewards of our resources, and we've chosen to invest in beautiful things that we can enjoy and share with others." The Perrys have given over 200 prints to the Westmont Ridley-Tree Museum of Art and contributed generously to the Perry Print Collection Fund to build the museum print collection. They have also bequeathed much of their collection to Westmont and have planned a generous bequest to care for the collection. As such forward-thinking stewards, Faith and Dewayne are members of the Wallace Emerson Society. Reproduced with permission from the spring 2009 issue of the Westmont College Magazine. For more information about how to direct a gift of art or property to the college in your estate plan, please contact the Office of Gift Planning at (805) 565-5068 or giftplanning@westmont.edu.